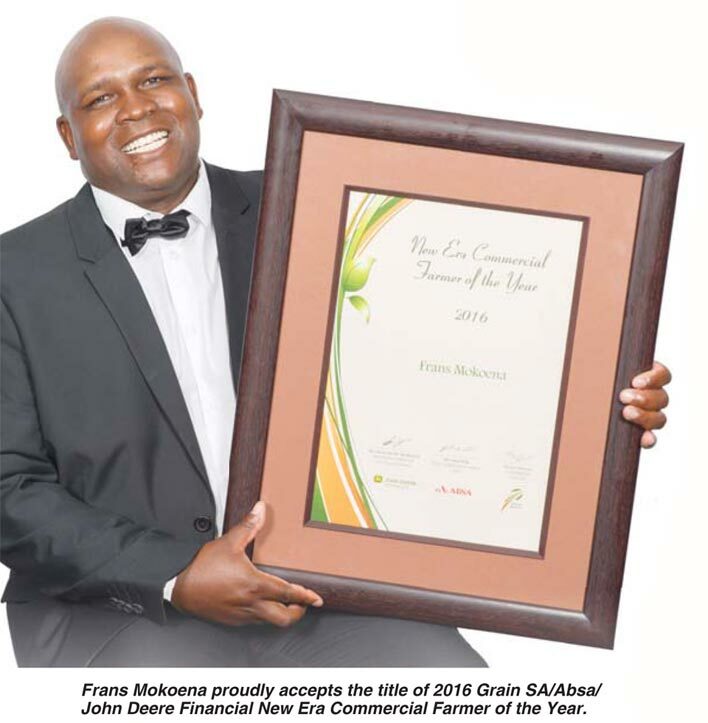 Frans Tshepo Mokoena (36) from Tweespruit in the Free State was announced as the 2016 Grain SA/Absa/John Deere Financial New Era Commercial Farmer of the Year at Grain SA’s gala event on 14 October. Together Frans and wife, Agnes, farms on 2 200 hectares – Frans is in charge of the crops, beef cattle and sheep and Agnes focusses mainly on the egg production and administrative tasks. Although this productive and business-minded farmer has had to face many challenges in his life, it has not prevented him from becoming a top farmer. With not enough funds to complete his schooling, he had to leave school after completing grade 6 and began helping his father with the daily farming activities. By the age of 21 he had lost both his parents and found himself solely responsible for the farm. He carried on the way his father taught him – by living with only the basics and saving money to plough back into the farm. Frans joined the Grain SA Farmer Development Programme in 2006 and teamed up with Johan Kriel. This partnership helped him develop as a farmer. ‘I am where I am today, thanks to the knowledge I obtained through Grain SA,’ he said in an interview. There are still challenges he has to face with not having suitable access to production finance, climate change and the high cost of inputs, but this hard-working farmer will not let anything dampen his excitement about being part of the future of agriculture in South Africa. Article submitted by Louise Kunz, Pula Imvula contributor.